My question today: Who do you miss right now? Thanks for stopping by today! Your comments make my day. 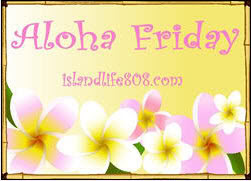 Be sure to visit by An Island Life for more Aloha Friday fun. I really miss my Nana. Would have loved to spend a Mother's Day with her and my boys. I would say right now I am missing my babysitter. She moved away and my youngest is now in preschool. Of course with preschool comes lots of good things and the bad part where we seem to be sick a lot more. That is the case today, two days of throwing up and strep throat on top of that. My mother who recently passed. Yesterday would have been her birthday. Well, I miss a friend. Melissa, I think today of all days I may not be the best person to answer this question :) but I do want to send you many happy Mother's Day wishes. I hope you have a wonderful weekend filled with lots of pampering and smiles. I miss my Papa who has been gone for over 20 years. I will always miss him. My mama- she's in New Hampshire and my Gramma - she's done with this life. I have a close friend going through a hard time and she's a long way away now - I miss her! I miss my husband... He's gone visiting a friend in Ottawa, so it's just my daughter and I fending for ourselves. My Auntie, haven't seen her in almost two years. I miss my mom and dad, only get to see them maybe once or twice a year. I miss my great Aunt. Hmmmm. I miss my baby niece. She is now living in another state. I miss my Dad, he has been gone for almost 2 years!